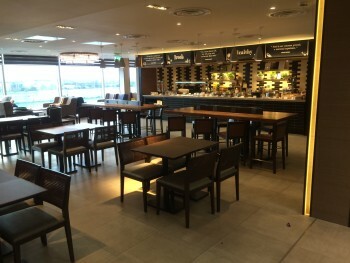 This is my review of the Plaza Premium departure lounge in Heathrow Terminal 4. 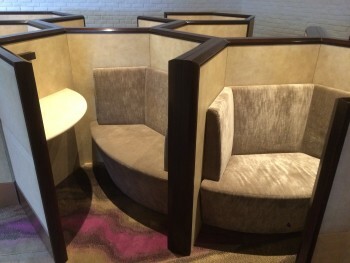 Full details of all of the Plaza Premium lounges in Heathrow including this one can be found on their site here. Two weeks ago I set off on what was, in retrospect, a fairly crazy whistle-stop tour of the Middle East. My original schedule was OK but, due to aircraft changes and availability issues, I ended up losing 12 hours. In the end I had a grand total of seven hours in Abu Dhabi when you exclude time spent asleep, in airports, on planes or in taxis! My original plan was to take the early morning Etihad A380 in First Class to Abu Dhabi. I booked this before the Etihad devaluation this Summer. I used a combination of the 25,000 miles Etihad credit card sign-up bonus and some American Express Membership Rewards points, transferred during a 25% conversion bonus. About a month prior to departure, Etihad withdrew the A380 from the morning flight. This meant I was forced to switch to the 2pm departure which had a 1.20am arrival into Abu Dhabi! Etihad operates from Terminal 4 at Heathrow. 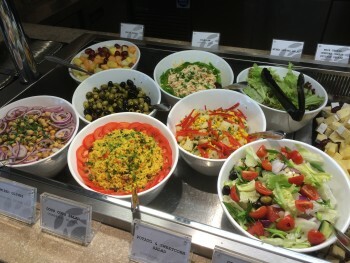 I reviewed the Etihad lounge in detail last year so I won’t cover it again. I did pop in for an hour and it remains very pleasant, albeit not huge. The plus points are the table-service food, which is of good quality, and the free Six Senses spa. 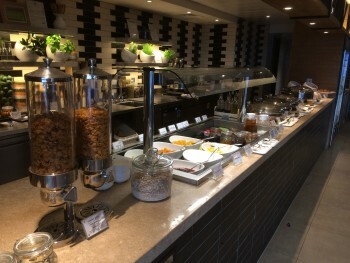 If you have a Priority Pass, you can choose between Plaza Premium and the SkyTeam lounge (my review of the Terminal 4 SkyTeam lounge is here). If you have a Lounge Club card via American Express Gold, you have no choice – Plaza Premium is your only option. For Priority Pass holders, you have the choice. Plaza Premium is calm and classy and fairly small. SkyTeam is huge, louder and a bit brasher. Honeymooners should head for Plaza Premium. Stag parties and families with enthusiastic children should head for SkyTeam. The rest of you need to decide which camp you are in! For a one off visit, you can buy entry in advance via the Plaza Premium website here. The lounge is situated directly above the Qatar Airways facility which is to the left as you clear Terminal 4 security. 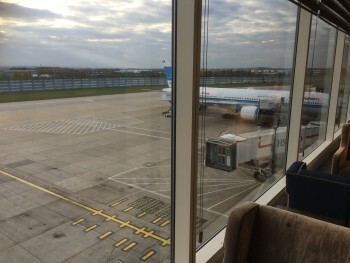 The Etihad lounge and the Etihad gates are a fair walk away down at the other end of terminal, to your right. What you realise as you enter is that the space is light, bright and airy. There are elements of Shoreditchy / warehousey styling but unlike, say, My Lounge at Gatwick, these are only light touches. The space is generally warm. Even the work pods are ‘cosy’! If you want to use a ‘house’ computer, however, you need to sit on a stool in the reception area. What is interesting is the bar. Terminal 4 is home to many of the Middle Eastern airlines – not just Qatar and Etihad but also Gulf Air and Saudia. 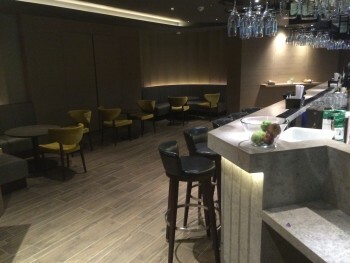 Possibly for this reason – or perhaps just for design reasons – the bar is in a totally different area. You need to leave the main lounge, walk through the reception area, and into another space on the other side. It was closed when I was there. All in all, I was impressed by this facility. 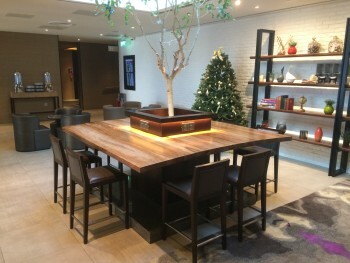 Rather like No 1 Lounges, Plaza Premium knows what it takes to run a good third party lounge. You don’t get the same number of bells and whistle as No 1 Lounges (no cinema, no kids room, no library) but what you do get is perfectly executed. 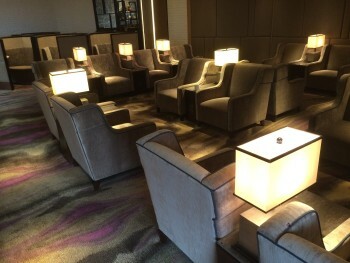 If you don’t get free access via Priority Pass or Lounge Club, you can buy access via the Plaza Premium website – although a cheaper option is to apply for an Amex Gold (free for Year 1) and get in using the two free Lounge Club access passes that come with it. 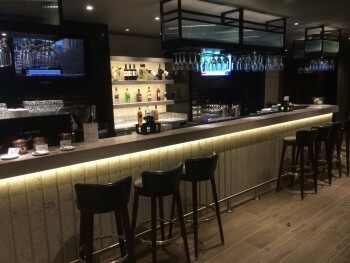 My reviews of the Plaza Premium Terminal 2 departures lounge is here and my article on the Terminal 2 Plaza Premium arrivals lounge is here. Buy up to 60,000 cheap Avios, from 0.7p, via Groupon! Plaza Premium T4 is also available for those us with genuine Barclays accounts via Dragon Pass (much better successor to Airport Angel), Rob. Oh, and OT, I’d really like the much hyped BA sale to start tomorrow as I need to make a long-haul booking by Monday and want to compare Willie’s offering with the opposition. This could be a new venture for you Rob, like an agony uncle, but people write in to describe their situation and you recommend them a lounge. “Football hooligan, aged 38, wishing to go on holiday to Italy with my fiancé. May go watch a game or two whilst there”. There’s money to be made here. Do you think football hooligans know the difference between ‘while’ and ‘whilst’, I wonder? Or the difference between fiancé and fiancée? Times have changed on that front. It’s an equal opportunities world these days. Who’s to say that all football hooligans are blokes? Not really. I was planning on a beach day but I ended up with about two hours! Abu Dhabi is a very important emirate to me. But I can not say that ‘you’ need more time there. Happy Christmas. I do 20+ nights a year in Dubai remember. And I may be off to RasAK soon! Anyone know if anyone other than Barclays has a Dragonpass hookup? I’m happy to sign up with Dragonpass directly but looking for a deal.